Shape 5 have released a new theme for October and if you run a gaming site then this could be the theme you are looking for. I say gamer and not a specific game, because the whole theme is transparent so you can pretty much put any image behind it and it will work on whatever game you want. 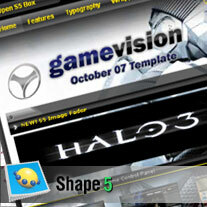 The demo site at Shape 5 have a Halo 3 image behind the theme so you can see how that works but there is no reason why you couldn't have WOW themed site or anything; as long as you have the image. It's a nice theme, deserves to be explored and if you're looking for something flexible, it could be for you. To visit Shape 5 click here.